This past Tuesday, my younger son and I were at the doctor’s office for his neurotherapy appointment. After he went into the treatment room, I turned to the receptionist and handed her the list of supplements for our current Lyme protocol. I was in a good mood on Tuesday, all smiles and joking around as I sarcastically commented about how much we love our supplements and what a wonderful journey Lyme disease is. I sat down and opened my book to read. “Excuse me, are you Karen Lynch?” another patient asked me, holding out his hand. I stood up. I didn’t know this gentleman. Was he an old client of mine? A former colleague? Was I in trouble? My mind raced as I tried to place him. “Yes,” I replied as I shook his hand and gave him a big smile. “My name is (name withheld), (name withheld) is my sister, she gave me the link to your blog; My wife and I have been reading and following your posts,” he said. He explained that his sister sent him a link to one of my blog posts and recommend he and his wife read it. His wife and son had both been diagnosed with Lyme. I couldn’t believe it. This man – and his wife – had been following my blog – my blog!! This man – and his wife – had found my posts helpful! I was elated and couldn’t stop babbling. “You have to tell the doctor, you’re reading it. She told me my writing would help others.” I probably sounded like an idiot. I often post on Facebook and Instagram: “If I can help one person, I’ve done my job” and here was proof: my writing, the sharing of my story, was helping not one but two people. What an honor. The man shared his story about his son, who, as a senior in high school had developed some behavioral issues that raised some concerns. It was determined his son’s issues were a result of co-infections of Lyme; his wife and son had both tested positive for Lyme co-infections and now he was seeing the doctor to “do his part” and get tested as well. I sat down. Tears welled up in my eyes. I was overcome with such emotion that I couldn’t speak. The man’s eyes softened as he apologized; he didn’t mean to upset me. I shook my head, holding back tears. The conversation wasn’t upsetting, it was the relief of knowing I wasn’t alone. 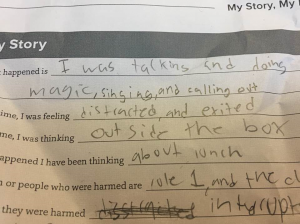 My son’s 5th-grade year was pure hell: his teacher was not sympathetic or patient with him and the Principal singled him out for running on the blacktop during lunch hour; she would not allow him to play flag football, and she made him sit on a bench or in the school office during lunch period. He was excluded from the 5th-grade graduation pizza party as a result of speaking out of turn in class. On the last day of school, he chose to stay home rather than walk across the stage to accept a diploma from a Principal and a teacher who allowed him to believe he was a bad kid. His behavioral issues were not by choice, he had no control over how Lyme infection was impacting his body. My tears reminded me of how my son was treated that last year in elementary school and how I felt like I was the world’s worst parent. My tears reassured me that what I am doing for my children and the sharing of my story is important, it can and will help others. My tears were for this man’s son and what he had to face under the guise of “behavioral issues” before getting to the root of the issue: Lyme. My story and how I share it comes from my heart. My story is important and will help others. I know it and saw it this past Tuesday. It still brings tears to my eyes.